Access: "CD-Rom -2 discs, #016 & 017 & U:\Geodata\Canada\Canada_sets\ArcCanada\"
The ArcCanada Schools & Libraries CD-ROM contains a collection of a wide range of Canadian statistical, political, physical, and cartographic data at three scale levels. National level data includes cartographic layers, the land potential database, ecological zones and regions, earthquakes and fault lines, census divisions and statistical information at a variety of scales. Provincial level data includes cartographic layers, soil landscape information, geological layers, digital elevation models, and statistical information at the census subdivision level. The CD-ROM also contains continental scale geology information, a local scale example of Kingston,ON as well as other utilities and software. From: http://www.esri.com/software/arclogistics/ : "ArcLogistics is a complete solution for creating optimized routes and solving scheduling problems. Create dynamic routes and schedules that cut fuel costs and improve customer service using ArcLogistics. From a small fleet operation to a large multiuser environment, ArcLogistics provides a quick and significant return on investment. ArcLogistics lends itself to fleet management across all industries including courier and messenger, food and beverage, furniture and business to consumer, local government, and many others. In addition to the U.S. market, ArcLogistics is available in many other countries with localized street data sets. With ArcLogistics you can * Determine which vehicle should serve each customer location in the best stop sequence. * Accommodate time windows while minimizing travel times. * Find accurate customer locations and calculate efficient routes. * Optimize resources by accounting for individual vehicle attributes (storage capacity, restrictions, special equipment, etc.)." Creator: Environmental Systems Research Institute INC. The ArcUSA� 1:2M database is a comprehensive vector basemap of the coterminous United States at a scale of 1:2 million. Features include state and county boundaries, hydrography, roads, railroads, place names, and federal lands. Index layers include latitude/longitude grids, a Landsat satellite scene index, and USGS quadrangle indexes for 1:24,000-, 1:100,000-, and 1:250,000-scale maps. Attributes for states and counties include 1990 census data; socioeconomic, demographic, and health statistics (from the mid-1980s); agricultural product and market value statistics; local government finance statistics; and general land use and soils information. Also includes 1:25 million-scale map data. The Banco de Informacoes e Mapas de Transportes (BIT) is a Data Bank and Map database featuring road, railway, inland waterways, and port transport of the federal and state territorial boundaries of Brazil. Includes four inset maps: Environs of Paris -- The World -- Sweden & Norway -- Egypt. Legend shows main lines of railways; other lines of railways; steamer routes; country boundaries. Legend states: The Figures printed thus over the surface of the Map refer to the Pages in the Guide where the trains on that particular Line of Railway may be found. CanMap Rail is Canada�s only 1:50,000 scale precision-based railroad network mapping data. Built with the same quality and precision of CanMap, CanMap Rail provides the complete picture of Canada�s rail infrastructure currently in operation, including railway lines classified as abandoned. Updated on a semi-annual basis, this comprehensive product allows the user to view and map rail line data and carry out analysis based on user requirements. CanMap� Rail V1.1 is Canada�s only 1:50,000 scale precision-based railroad network mapping data. Built with the same quality and precision of CanMap, CanMap Rail provides the complete picture of Canada�s rail infrastructure currently in operation, including railway lines classified as abandoned. Updated on a semi-annual basis, this comprehensive product allows the user to view and map rail line data and carry out analysis based on user requirements. CanMap Rail V2.2 is Canada�s only 1:50,000 scale precision-based railroad network mapping data. Built with the same quality and precision of CanMap, CanMap Rail provides the complete picture of Canada�s rail infrastructure currently in operation, including railway lines classified as abandoned. Over 20,000 Populated Placenames Topographic coverage of 157 urban areas as of the 1996 Census Street centerline road network, names and address ranges Topographic features Regional & Municipal boundaries 6 cartographic classifications Major roads and highways as a separate layer and cartographically distinguishable from other streets Canada/US border crossings (point of entry) - including name of US road linking to Canadian roads across the border Contains Golf, Hospitals and Education Points of Interest GPS - ready high positional accuracy Workspace/Project to open all files with zoom layering Land-use classifications Building footprints Buffered street centerline road network casements Railway and utility features Topographic features and named geographic features Provincial, regional and municipal boundaries include Land Area calculated by DMTI Spatial and Population and Dwelling Counts from the Statistics Canada 1996 Census. Canadian road fabric containing 1,905,847 records 87% population coverage based on addressed segments 99% population coverage based on named segments Street naming for communities down to, and in some cases, under 1,000 population * Street addressing for communities down to, and in some cases, under 2,000 population * CanMap Streetfiles� comprehensive nationwide coverage provides detailed topographic and geographic features at the highest level for all major Canadian Urban Areas. The Digital Chart of the World (DCW) is an Environmental Systems Research Institute, Inc. (ESRI) product originally developed for the US Defense Mapping Agency (DMA) using DMA data. We used the DCW 1993 version at 1:1,000,000 scale. The DMA data sources are aeronautical charts, which emphasize landmarks important from flying altitudes. This explains why there is a separate aeronautical theme with all conceivable airports, yet why on some themes small islands and lakes are simply unnamed points. ESRI, in compiling the DCW, also eliminated some detail and made some assumptions for handling tiny polygons and edgematching. Also, note that the completeness of the thematic categories present in each layer will vary. Please read the layer descriptions (through links in the following table). Creator: published by authority of Department of Agriculture and Immigration Province of Manitoba. Primary map shows Southern Manitoba. Two smaller maps show province of Manitoba, and Manitoba on the North American continent. Map lists number of banks and branches; bank clearings year 1916; miles of railway in operation, 691 elevator capacity; total land area; area under cultivation; total arable land. 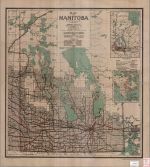 Shows Manitoba map townships; municipal boundaries; railways. 1 map on 4 sheets; 129 x 120 cm., on sheets 75 x 78 cm. Relief shown by spot heights and soundings. Also shows routes of Canadian Pacific, Grand Trunk Pacific, Canadian Northern and Great Northern (U.S.) railways. for further information and description of item, see library catalogue record. This series was created to provide hard copy maps for the Ontario Base Mapping OBM program covering the Metro Toronto Region. Each map covers an area of 25 sq. km and shows topographic features with 5 metre contours. Buildings less than 100 sq. m. are symbolized, others are shown in outline, roads are pavement edges. 1 km. grid lines are of the Ontario Modified Transverse Mercator Projection. Data includes: Building lines, hydro towers, curbs, curblines, curb points, catch basins, electrical pols, garage lines, garage polygons, general poles, historical sites, fire hydrants, light standards, miscellaneous structures, parks, pathways, pedestrian street lights, railways, spot elevation, street car tracks, street lines, street names, subway tracks, telephone poles, traffic lights, and transmission lines CAD files are for 2006 PDF files are for 2007. Also available on DVD and DMGC local intranet. Note that only U of T IP addresses will allow you to use this resource online. The U of T wireless network does not allow you to log into this resource. 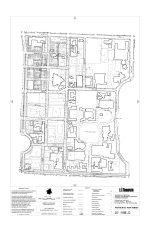 As well, please download the .PRJ files in order to have proper geographic information attached to each DWG file. Data includes: Building lines, hydro towers, curbs, curblines, curb points, catch basins, electrical pols, garage lines, garage polygons, general poles, historical sites, fire hydrants, light standards, miscellaneous structures, parks, pathways, pedestrian street lights, railways, spot elevation, street car tracks, street lines, street names, subway tracks, telephone poles, traffic lights, and transmission lines CAD files are for 2006 PDF files are for 2007. Also available on DVD and DMGC local intranet. Note that only U of T IP addresses will allow you to use this resource online. The U of T wireless network does not allow you to log into this resource.